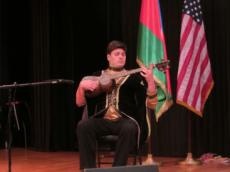 Supported by the Consulate General of Azerbaijan in Los Angeles, a concert program of Azerbaijani mughams was presented in San Diego, the second largest city of California, US. As earlier reported, the concert entitled "35 years of space travel of Azerbaijani Mugham", dedicated to the 35th anniversary of the Voyager Golden Records. As it is known, the Voyager Golden Records are phonograph records which were included aboard both Voyager spacecraft, which were launched in 1977. They contain sounds and images selected to portray the diversity of life and culture on Earth, and are intended for any intelligent extraterrestrial life form, or for future humans, who may find them. Azerbaijani mugham was also included into the record. The event was addressed by the Consul General of Azerbaijan in Los Angeles Nasimi Agayev, who spoke of the national musical heritage of Azerbaijan, in particular, the mughams. The Azeri mugham masters performed pieces of mughams, national folk songs cheered by the audience in San Diego.